We believe in transparency. Not just in sharing our vision, roadmap and product updates. It’s on everyone’s mind across our team. It has been an important guideline that we have set since the beginning of IPLv2, and today we are happy to continue being transparent with figures and insights. 59% engagement in earn and spend opportunities. 19% spent on at least one sticker pack. Our users received an initial award of 6,000 KIN (it costs 8,000 KIN to purchase a sticker pack). Any user who wished to buy a sticker pack needed to answer at least one poll question and earn more Kin. This was done so that Kik users could experience the flow of earning Kin, and so that we could better understand the users interaction with the system. 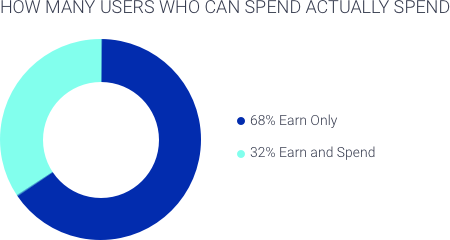 In addition, we saw that there are more users who participate in polls that keep their Kin (68%) vs. users who choose to spend it (32%). Poll completion time stands on an average of two minutes. 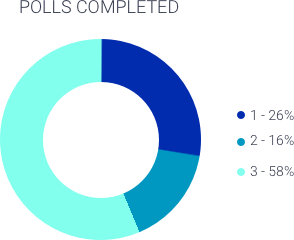 As you can see by the pie chart below, 58% of the people who chose to participate in a poll completed all 3 polls — this is huge! 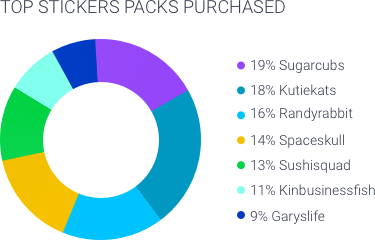 19% of our wallet users have spent at least one sticker pack. 1.75 average sticker packs purchases per wallet user. 26% of our the users we targeted via our Kik Team bot responded by tapping “I’m Interested” (and only 10.6% “Not Interested”). This conversion rate is a great start for Kin! In comparison recent campaign we had with Truth Or Dare bot had ~17% conversion rate for similar flow. 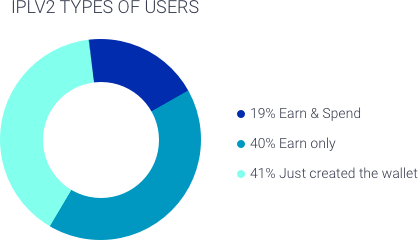 Our effective conversion rate is 15% which is an excellent start for our Kin journey! We are also very content that technically every user who accepted the terms of service has a true Kin wallet pre-loaded with Kin and a bit of Ether (to fuel the transactions). 15% of our users continue to check out their balance page after their first day. This is a great benchmark showing our users are looking to engage in more offers. No active retention attempts where made (such as re-engagement calls for actions or additional offers). We targeted U.S./East Coast Kik users so naturally their main response time is in the first hours to the communication. The graph below shows that user activity continues along the day and is very limited during night time. Apart from the exciting takeouts we have seen above, we also learned a great deal from working with Ethereum as the blockchain infrastructure for the Kin wallet. In our initial awarding process we set a higher gas price in order to complete the wallet creation in a short time. This resulted in high cost for wallet creation. We awarded users with both ETH and KIN resulting in up to ~$6 in fees. For the earn and spend actions, the gas price was lowered to match reasonable time for confirmation time. 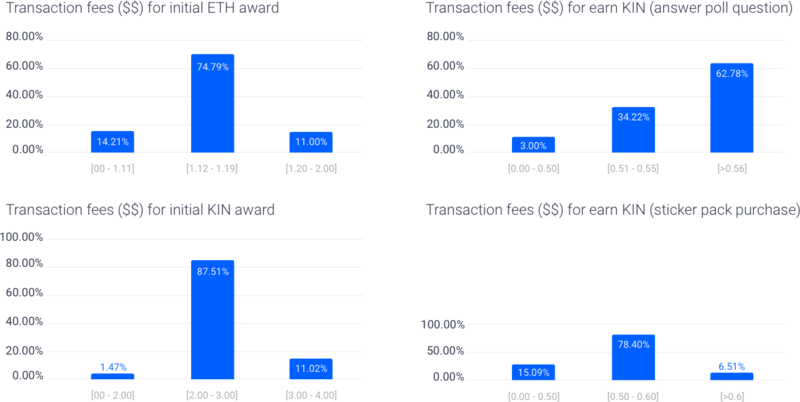 Our analysis below shows that even though gas prices were set to a fixed value the actual transaction fees were not deterministic. This is mainly due to network congestion we encountered across the entire month. 98% of our initial awards were completed within a couple of minutes. This is mainly due to the fact we used a high enough gas price for the initial KIN/ETH award transactions. 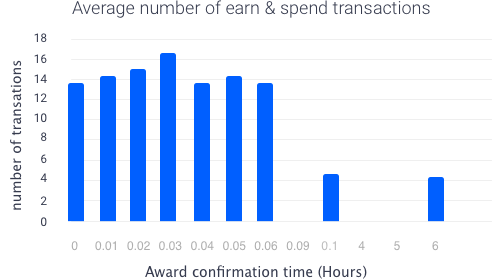 Nevertheless, 2% of our users encountered high confirmation time for their initial award. 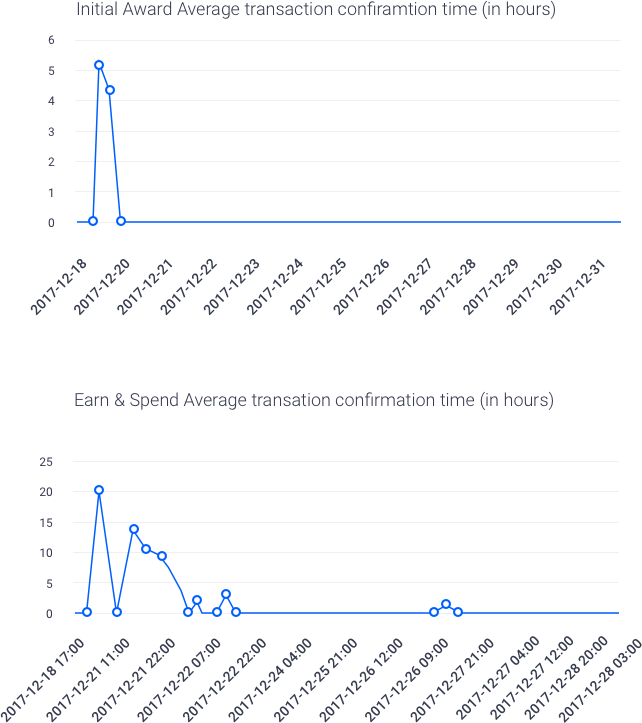 This caused them to less engage (earn/spend) due to them technically not having the initial award confirmed on their Ethereum wallet. 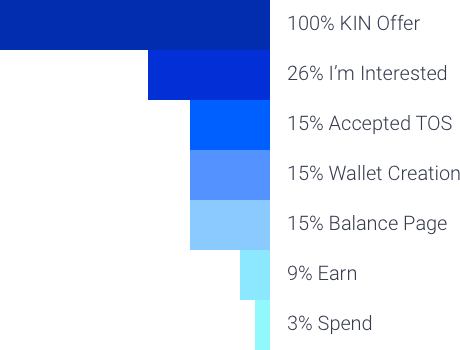 The Kin initial product launch taught us so much about our users, about their interest in Kin and about Ethereum. Kin’s potential is huge. It’s not just a hunch. We have the benchmarks to support our vision. We also need to have a scalable foundation for number of users and the amount of transactions, so we will have to move Kin to a different blockchain as part of our roadmap. We are very exited to move on to the next steps in bringing a new economy the masses and to see how Kin will power a digital sharing economy of equal opportunities. Thanks to Alex Frenkel, Natasha Shine-Zirkel, and Elad Weizman.